Why some websites don’t look good on smartphones. To understand the problem we have to go back in time. In the days when you could only view websites on a desktop computer, the ‘window’ size was fairly predictable, so was the resolution - 72dpi. The advent of smartphones and tablets caused some issues, but these were generally solved by giving websites three standard formats; desktop, tablet and mobile. That was all fine until the screen sizes within each format began to grow, so much that there is no longer any ‘standard screen sizes’. Also, people began using their mobile devices more than their desktops. So, although you can still see websites, the size of the content or buttons are too small to be effective. You can of course ‘zoom in’ but that looses you the overall context of the page - you can press the ‘buy’ button, but no longer see the image of what you had just bought! screen, its the same with text. So, with ‘responsive’ websites some content is allowed to re-scale and some is ‘fixed’ at different screen sizes. It all gets a bit complicated during the design of a website, but if you want every visitor to have a good experience, the work is essential. Because of the massive increase in the number of people using their smartphones for searching online, some web designers have started to design for the smartphone first and then scale/reconfigure the content up for the other format/screen sizes. Unfortunately, this might result in websites being more functional than entertaining in future, but it does seem to be the way things are going. 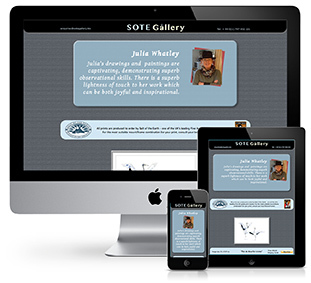 So, if you want your website to be valid and give your visitors a rewarding experience, make sure its ‘responsive’. Why is fine art paper so expensive? When you compare the price of an A4 sheet of fine art paper with a sheet of regular copy paper, the fine art paper is significantly more expensive. Why should this be? Surely they’re both just paper? The answer lies in the weight, materials and longevity. Fine art papers are much heavier (thicker) than ordinary paper, but it’s the longevity that really counts. Fine art papers are designed to last, to not discolour or loose their stability over time. They’re produced to stringent ‘archival’ standards. They’re also made from cotton and not cellulose pulp, which needs acids to break it down during processing. The cost of the basic material is vastly different and so is the manufacturing process. Copy paper, or any everyday paper, is made at high-speed in massive volumes. It’s fibre structure has to be capable of being run through very fast printing and processing machines under high tension. Fine art papers need very different qualities and are produced to a much higher standard that requires a consistent surface texture, accurate colour and overall stability. For painting, they must be able to take a wide range of applications, from watercolour paints through to oils and spirit-based inks. They mustn’t distort or warp under the applications and need to be durable enough to take many layers of application and workings. For fine art printing the paper requires a special ‘inkjet’ coating to take the giclée printing ink. Again, the surface needs to be accurate in its colour and consistency. Fine art paper can be ‘on display’ for many years, so the ‘archival’ quality is essential to keep it pristine. The best papers are made in Germany or the USA, but there are some paper mills in the UK producing adequate papers. 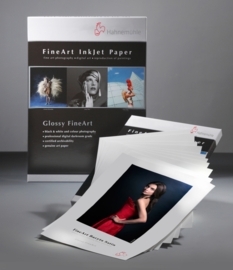 There are also many variations in the types of fine art paper available. Papers with different textures, colours and composition. Many people will only work with one type of paper, much in the way they’ll only use one brand of brushes or paint. Fortunately, there’s a wide range of papers available to allow for individual tastes and styles.